BRIELLE – A rebel group has conquered the city of Brielle. The group of pirates, that calls itself the Watergeuzen, the city could take virtually hassle. Government troops were withdrawn from the city months ago. The Beggars have claimed the city in the name of rebel leader William of Orange. The Watergeuzen form a group bannelingen and avonturies, led by peers who have left their homes, fear of religious persecution. William of Orange gave them permission to wear the orange, white and blue of the insurgents. William II de La Marck, Nationaal Archief. Maker: unknown. The group is led by Commander William II de La Marck. He is known for his fierce stance against Catholics and warns they do not involve violence. The beggars operate under more from England, where they are tolerated by the British Queen Elizabeth. 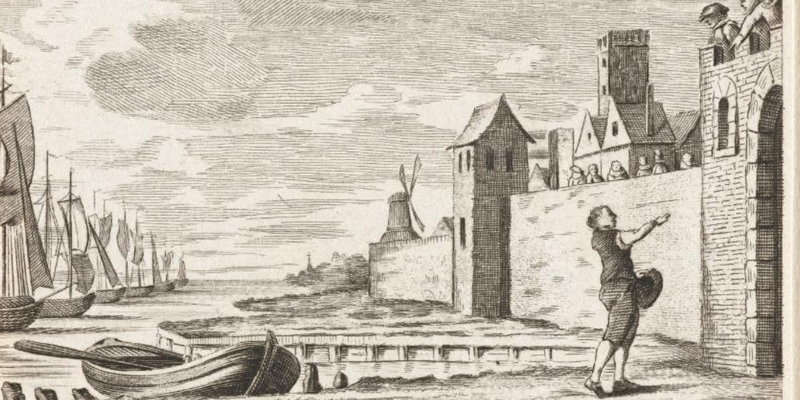 During raids last year sacked the Beggars Monnickendam and Schellingwoude. It came to a confrontation at sea with a fleet of the Duke of Alva in Emden. That battle was lost, but escaped many ships to Dover. After talks between the Spanish King Philip II and Elizabeth of England, told the buccaneers that they were no longer welcome in England. The dozens of ships left thereon Dover and headed for Northern Germany. But the ships coming through the bad weather from around Brielle. first by a ferryman in the area noticed the Beggars. He came into contact with Geuze commander Lumey and was instructed to go to the city council of Brielle. The ferryman was mayor Koekebakker convey an ultimatum, where the surrender of the town demanded. He received the ring from Blois officer of Treslong note, in the hope that it persuades the council. The city council was a serious dilemma. On the one hand was to defend the city barely. But on the other hand, the beggars had a very bad image. The beggars were known as' pape haters "and were not afraid to use violence against all that was Catholic. But surrender risked the wrath of the Duke of Alva. A few hours later Lumey decided to increase the pressure to proceed with the first troops ashore. It meant that there was panic in the city. the city council, wealthier citizens and Catholic clergy – who had iconoclastic still fresh in the memory – meanwhile left the city by the South Gate. "In the name of Orange ..."
Meanwhile the troops of Lumey had himself drawn to the closed gate of Brielle on the north side of the city. After talking Lumey had learned with ferryman Coppelstock that the city was barely defended and so was easy prey. According to eyewitnesses, the Beggars leader would have given a final warning by 'In the name of Orange, open the door to call the port '. We then rammed the North Gate. The local soldiers to defend the city offered no resistance. Whether Brielle Egyptians died is unclear. It is certain that the Beggars have wreaked havoc in the city proper. Brielle was during the Iconoclasm, six years ago, stripped of all Catholic utterances. In recent years, were replaced all the statues and altars. The Beggars have again demolished all structures replaced. 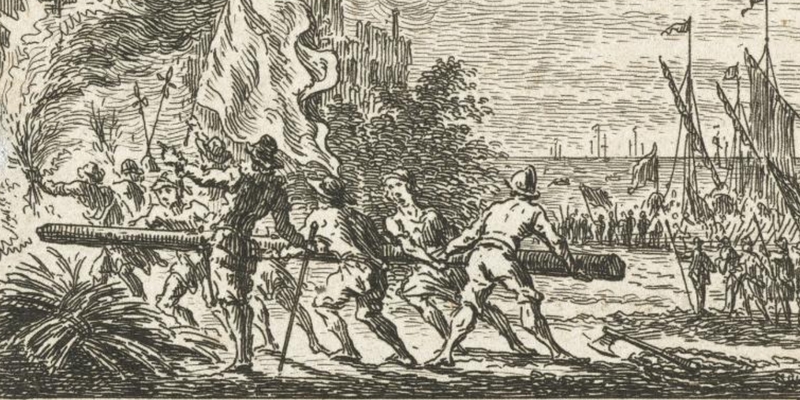 Captain of Blois Treslong could hardly avoid some 'papist' buildings were set on fire. 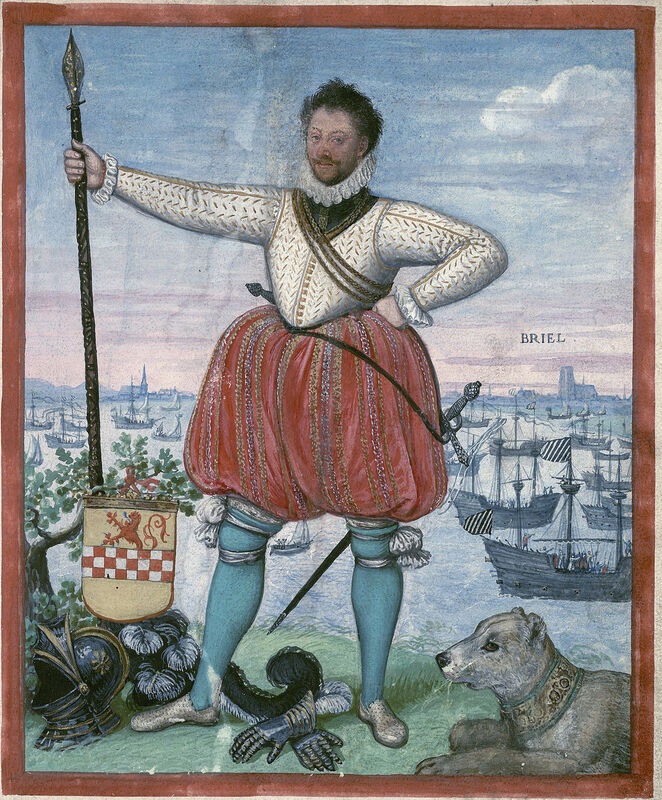 Portrait of Willem van Oranje (1555). The insurgents intake of Brielle is the first piece of land they have owned. 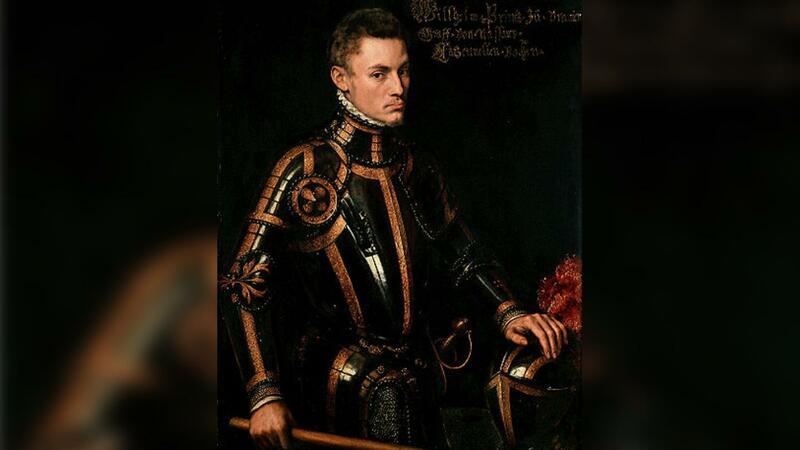 The armed struggle against the Duke of Alva began five years ago under the leadership of former Governor William of Orange battles in Wattrelos, Lannoy, Oosterweel and Valenciennes. Since then were battles took place at Dalheim, Heiligerlee, Jemmingen and Geldenaken. Only Heiliger was a victory for the insurgents. William of Orange and his allies were then withdraw and thus seemed the uprising beaten. These victory ensures that the insurgency is revived. To our knowledge Alva has laconically commented on the loss of Brielle. Nevertheless, it is expected that governor Hénin-Liétard, the Count of Bossu, it will send troops toward Brielle to recapture the city. The Beggars mainly showed their strength on the water in recent years, will have to show whether they are worth something on land. The counterattack of the Spaniards 5 April little to show. Because the town carpenter Rochus Meeuwis Son a lock knows to cut open, the surrounding land runs under water. The Spaniards are reduced on a dike and flee on foot away, because their ships are burned by the Beggars. The laconic attitude of Alva at the loss of Den Briel would get him dearly. Under the direction of the Watergeuzen the comeback of the uprising was ushered. The Beggars take multiple cities, as Delfshaven, Schiedam, Flushing and Dordrecht. These are piece-by-piece main towns. In any case, more important than Brielle. The Spaniards who want to sweep targeting the road in Rotterdam Delfshaven a bloodbath. One of the first victims was the blacksmith Jan Swart, where the Black Janstraat is named. Even Mayor John Roos is slain. A few weeks later the main cities of Holland together in Dordrecht. As William of Orange asks to support the fight against financial Alva. That support he gets. The insurgents have made three months before the first substantial progress after the intake of Brielle.